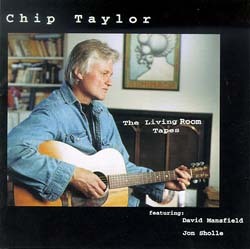 Chip Taylor "The Living Room Tapes"
Taylor has had a long career in the music business and is undoubtedly one of the industry's most successful songwriters. He has penned dozens of Top 40 hits, including "Wild Thing", "Angel of the Morning", "I Can't Let Go", and "Try (Just a Little Bit Harder)", just to name a few. In 1996, Chip recorded all-new versions of some of his biggest hits for his "Hit Man" album (Gadfly 220). "The Living Room Tapes" is the first album of all-new material from Taylor in nearly 20 years.